Shambray: What is your favorite type of workout? This post is written by Melissa, health/fitness contributor. Also, check out her blog at On the Go Healthy Moms. <>Do you like to use equipment, or do your own exercises as part of your workout? <>Do you like to Walk/Jog/Run Outdoors or Indoors? 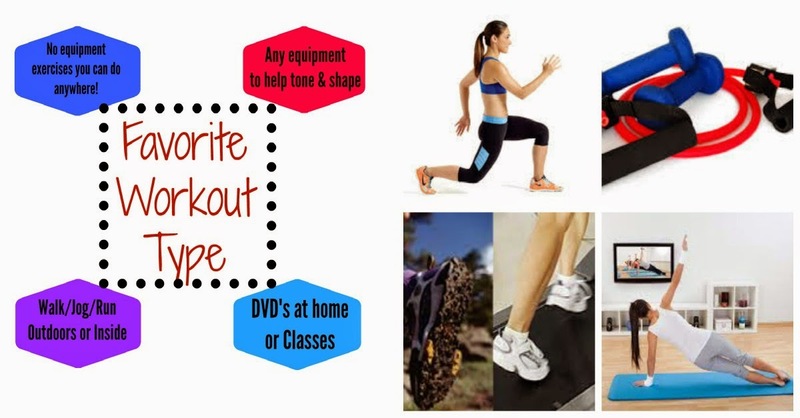 <>Do you like to Workout from Home using DVD's or video's online? <> Do you like to workout at the Gym and attend Aerobic classes or use the cardio and weight machines? What workout do you find yourself enjoying the most and for what reason? Everyone leads a busy life. We all have responsibilities that require our time. Here are some ideas of how you can be active so that you can fit in a 30 minute or less workout that will keep you healthy! Picking a sport that you love! There are many more, what do you do to keep yourself exercising each week? Doing any kind of activity when you are at work and need to squeeze it into your day is another great way to find the time if it isn't happening in the morning or after you get home. It important to find the time and make it a priority. Our bodies and minds need some kind of exercise. Which one will it be for you? Also, get more health and fitness information at On the Go Healthy Moms. Riding my bike on a stationary trainer is my favorite exercise. I can easily set it up anywhere- in the backyard while my kids jump on the tramp or inside infront of the TV. Does anyone else have ideas for multi-tasking while exercising? I like to read audiobooks or listen to you tube video's or podcasts on my favorite topics like health, fitness, inspirational topics, blogging.